Pairing free verse with over three hundred pages of black-and-white watercolor illustrations, Mary’s Monster is a unique and stunning biography of Mary Shelley, the pregnant teenage runaway who became one of the greatest authors of all time. Legend is correct that Mary Shelley began penning Frankenstein in answer to a dare to write a ghost story. What most people don't know, however, is that the seeds of her novel had been planted long before that night. By age nineteen, she had been disowned by her family, was living in scandal with a married man, and had lost her baby daughter just days after her birth. 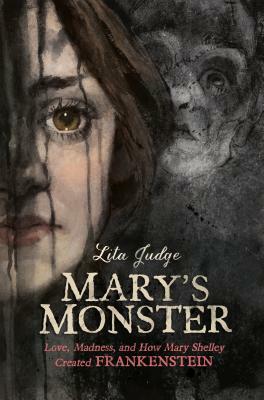 Mary poured her grief, pain, and passion into the powerful book still revered two hundred years later, and in Mary's Monster, author/illustrator Lita Judge has poured her own passion into a gorgeous book that pays tribute to the life of this incredible author. Lita Judge is the author and illustrator of several award-winning picture books for young readers, including How Big Were Dinosaurs?, Bird Talk, Born in the Wild, Flight School, and Red Sled. After a summer spent reading the handwritten journals of Mary Shelley, Lita embarked on a five year journey to tell the story of this courageous teenager in Mary’s Monster. She lives in Peterborough, New Hampshire, with her husband, two cats and a parrot.